In the world of horn playing, Bruce Atwell has done it all. He’s performed in high level professional ensembles – the Philadelphia Orchestra, Hong Kong Philharmonic, and Milwaukee Symphony, to name a few – recorded multiple solo CDs, performed at numerous workshops and conferences, and taught at the college level. 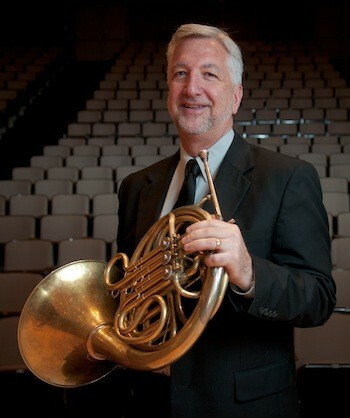 He is currently Professor of Horn at the University of Wisconsin-Oshkosh, and maintains a very active performing career. I got to know Bruce while in graduate school at the University of Wisconsin-Madison, and performed with him in the Oshkosh Symphony. His playing was always inspiring, and accompanied by a positive and encouraging attitude. Recently, I found out that Bruce had undergone lip surgery, and was in the process of getting back into shape. Since this was a topic that I felt would be of interest to other horn and brass players, I contacted him and asked if he would be willing to talk about this experience in a brief interview. Bruce generously agreed to share his thoughts, and responded with great candor. James Boldin: In 2012 you had surgery on your lip. Could you share some background on why you had this procedure? Bruce Atwell: Starting in 2010 I noticed a callus on the center inside of my upper lip-exactly at the vibrating surface. I tried not playing for several weeks but saw no change in the callus. I spent the next year talking to various doctors, dentists, oral surgeons, and dermatologists about the possible cause and treatment options. Most of the people I saw had no idea what had caused it and did not have recommendations for treatment. I saw a dentist in Chicago (John Kelly) who has experience with brass players. His analysis was that from years of playing, the skin on my upper lip had stretched and was now hanging down and rubbing against the bottom of my front teeth, causing the callus. He suggested using Invisalign to cushion against further damage. I tried this, but had no success in eliminating the callus. During the time my playing was becoming less and less reliable. The vibration would stop without warning and I was losing upper register. After two years of searching I finally decided that surgery was the only option. JB: How helpful were your care providers (doctors, nurses, etc.) in explaining the procedure, and its possible effects on your horn playing? Did you consult with any other horn teachers/players before deciding to have surgery? BA: I made a large mistake in this area. My insurance would not cover a surgeon out of network-meaning I only had access to a local oral surgeon who had no experience working with brass players. I was desperate at the time, so decided to trust him. He did warn me that he wasn’t sure what the end result would be in terms of playing. Initially, he said it would be a small incision. However, once he started the surgery, he decide that a longer incision was necessary. I now believe I should have seen Dr. Vander Kolk in Baltimore or at least a plastic surgeon locally to do the procedure. JB: Do you know of any other horn or brass players who have had the same or a similar surgery? BA: I know of several who have had the orbicularis orbis repair done-but I haven’t encountered anyone with this same issue. With the former, the incision is on the skin between the lip and the nose-not directly in the lip. JB: Was it a fairly simple procedure? Inpatient or Outpatient? Local or general anesthetic? BA: My incision was about three inches long right along the wet/dry line. It was outpatient under local anesthesia. JB: How long did you wait after the surgery before you resumed playing? BA: I waited about two months before playing anything. It was at least six months before I could really accept professional work. JB: Did you, or do you, experience any residual pain or numbness after the surgery? BA: I don’t have any pain or numbness. I do have scar tissue along the incision line that I think is now permanent. This restricts flexibility somewhat and has affected endurance and range. I used to be a high horn specialist (although I played fourth horn professionally for several years) with a range up to about concert C above the staff. Now I only have about a concert G and that is not particularly reliable. JB: What kinds of materials/exercises did you practice when you resumed playing? Would you recommend these materials/exercises to other players recovering from injuries or medical procedures? BA: I tried everything I could think of. I started with long tones and soft slurs through the harmonic series. I also contacted Lucinda Lewis and received some advice from her concerning blocked buzzing. I found that useful, but you have to be very careful with that, since in my case it caused me to play with too much tension. I’ve also had lessons with Bill Vermeulen, Gail Williams, Dan Grabois, and Wendell Rider and spoken to numerous other brass players. The best routine I’ve found is Wendell’s harmonic series exercises, following Bill’s and Gail’s advice to use only the minimum amount of embouchure tension to achieve each harmonic. This has resulted in gains in range and endurance-although I’m still far from 100 per cent. JB: Aside from playing the horn, have you done any other type of physical therapy to aid in your recovery? BA: I also saw a chiropractor who did Active Release Therapy- a type of massage to break up scar tissue. This was effective for the left side of my lip, but unfortunately was not successful in breaking up the scar tissue in the center. I am also speaking to a plastic surgeon about the possibility of having a lip filler injected in very small amounts to replace some of the tissue that was cut out. JB: How, if at all, has your physical and/or mental approach to playing the horn changed during your recovery process? BA: I am forced to focus much more on breathing and relaxation now. I’ve also gone back to the three well-spaced hours of practice I used to do as a student. Mentally, I still have days of extreme frustration, but I try to keep it in perspective. JB: Did you consult with any other physicians or occupational/physical therapists during your recovery? If so, were they helpful? BA: I did speak to Dr. Vander Kolk in Baltimore recently. He said he would be happy to see me, but didn’t really know if he could offer any more solutions at this point. JB: Do you have any advice for other brass players who might be considering lip surgery or going through post-surgery recovery? BA: I would strongly advise against lip surgery. I think there were other options available to me that I did not consider fully-such as an extended layoff (a year or so)-or trying different methods of playing-minimal pressure, shifting pressure to the lower lip, etc.I was resistant to a long layoff because of the financial implications-but the end result is much worse that if I had simply given up work for a year or more. The surgery has permanently altered the structure of my lip and I’m still not sure if I will ever completely recover. Even if I am able to regain more playing ability, it will never feel the same-I don’t believe horn playing will ever be effortless for me again. JB: Any other comments you would like to share? BA: Don’t make decisions like this when you are in the middle of the problem. Try to get rational advice from friends and colleagues and listen to them. Try an extended period of not playing first. Then come back very slowly and carefully under the guidance of an experienced teacher. Editor’s Note: For those interested in following his story, Bruce regularly posts updates on his progress to the Horn People group on facebook. Here’s the Japanese translation of this article.